as train station bars go, this ones not bad. classier decor than some places, witha nice high bar, to sit around. the outdoor area is decent too. Wonderful little pub and not overpriced for the area. Patio heaters on the station concorse are a little over the top, not very eco-friendly! The Sharps is usually in wonderful condition. Also, a recent addition is Verdutt Blanche, a belgian wheat beer. The main bar is now open. It could not be less like the old Shires bar if it had been turned into a disco. To be truthful I would not step inside this kind of shiny steel place, but having enjoyed the outside bar so much I had to try the inside one. Very much a food pub but the handpulled ale was very good. Finding the unisex toilet however is a nightmare. I recommend this pub, but it has some strange ideas. I whiled away a pleasant 40 minutes here recently waiting for a train. It was a bit chilly but I could have borrowed one of the thoughtfully-provided blankets if need be. The party at the table next to me were clearly regulars, commuters on their way home, which was good to see, treating the place as a local. The Doom Bar was okay but not in tip-top condition. 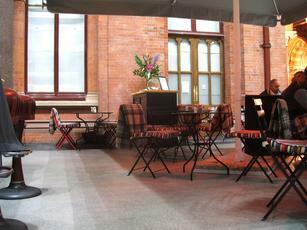 I heard about this temporary pub on the station concourse and thought I�d pay a visit before it disappears. They advertise cask ales but I was a bit wary when I didn�t see any pumps, until that was I spotted two barrels with Pride and Doom Bar on gravity dispense. The �3 a pint Doom Bar wasn�t the best I�ve had recently but it was drinkable. Although the pub is technically inside, because it�s in the aircraft hangar like St Pancras Station it can get cold, so they have patio heaters and travel rugs available for cold evenings. Food is served but it looks as if they stop at 7pm. Decent place to sit and people watch as everyone detrains (is that the right word?) and heads for the giant �Meeting Place� statue with their cameras.